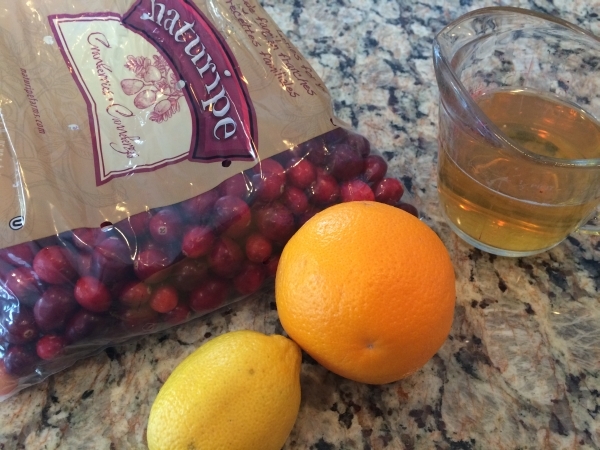 I love cranberries. I typically by them in a can and I’m not the gal who only associates this treat with Thanksgiving. 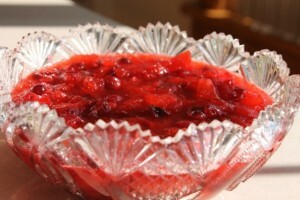 Cranberry sauce is a relish made out of cranberries boiled in sugar water until the berries pop and the mixture thickens. 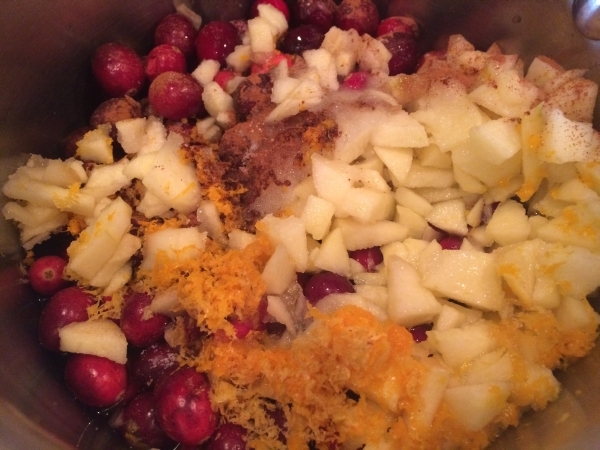 Some recipes include other ingredients such as orange juice, zest, maple syrup, port, or cinnamon. It tastes great with puoltry and pork and it is really good combined with gravy and used as a dipping sauce for fried won tons and other foods. Cranberries are one of the most unique fruits in the world. One of only three fruits native to North America, cranberries grow in the wild on long-running vines in sandy bogs and marshes. 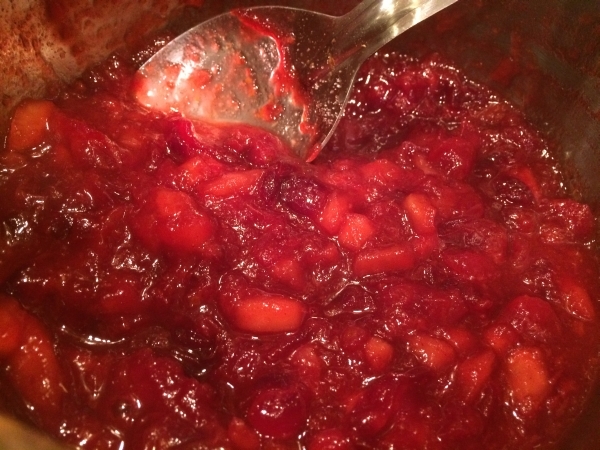 While they’re primarily harvested in the Northeast, cranberries also grow in other parts of North America, like Wisconsin and the Pacific Northwest, and in Chile. Cranberries weren’t farmed on a large scale until the 1800’s. At first, growers picked the berries by hand. They then developed a more efficient dry harvesting technique, later revolutionizing the process with an idea called wet harvesting. By flooding the bog with water, the cranberry’s buoyancy allows it to float to the surface, where they are collected. 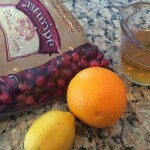 I had bought a large bag of fresh berries because I use them as decorations during the winter months. I filled two clear glass, empty wine bottles with the berries and fill with water. Each are topped with pretty candles that I received a few years back from my friend Laura; and use for colorful centerpieces throughout the Holidays. I had about two cups remaining berries in perfectly good condition and decided to prepare fresh sauce for Thanksgiving. They really turned out delicious and it was so easy, I’ll likely make them again! 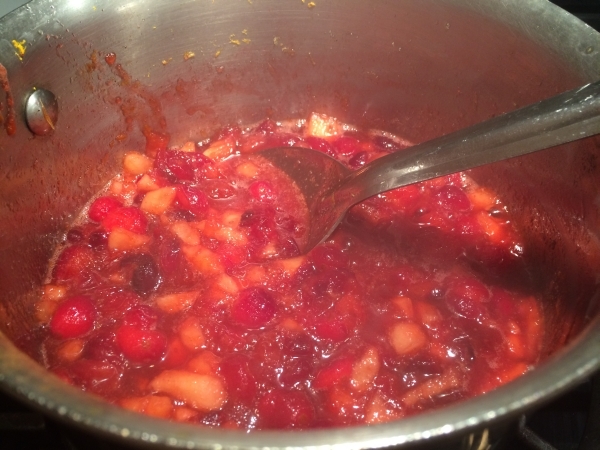 Bring to a boil and then lower the heat and simmer on low until the berries pop. Stir and cook for about 10 minutes until the sauce begins to thicken and the apples become soft; about 10 minutes. The sauce will become thick as it cools. Serve chilled! 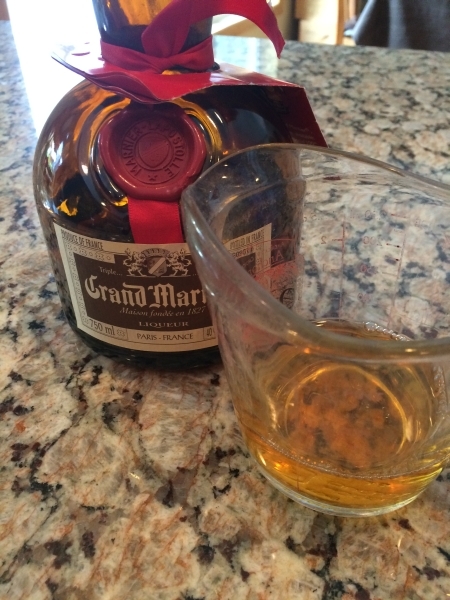 Be careful opening the Grand Marnier Cordon Rouge, which is an orange-flavored cognac liqueur. 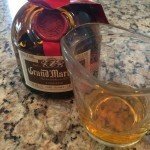 It is made from a blend of Cognac brandy, distilled essence of bitter orange, and sugar. 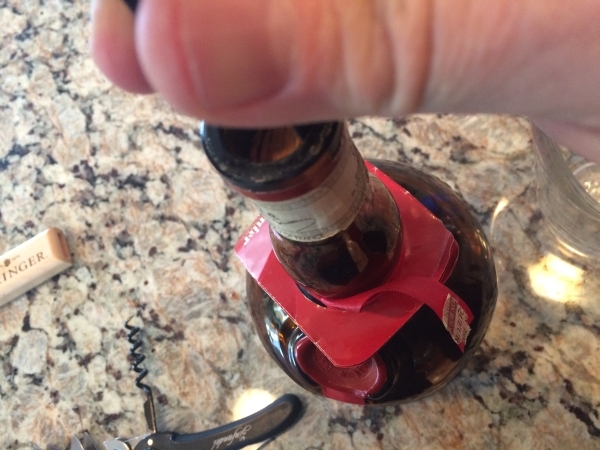 Because it can be sticky, my cork got stuck and I had to call Bill to help me remove it with Ah-so!